The 19th century introduced new and increasingly efficient forms of transportation and communication to Newfoundland and Labrador. Roads and railways linked many isolated communities by providing fast and convenient modes of land-based transportation, while government-subsidized steamships transported mail, freight, and passengers to remote coastal settlements and urban centres. Heart's Content, NL served as a terminus for the world's first submarine transatlantic telegraph cable. Watercolour by Robert Dudley. Courtesy of Library and Archives Canada (C-150019), Ottawa, Ontario. At the same time, the telegraph and telephone replaced mail as more efficient means of communication able to place people in almost instant contact with friends, family, or business associates in other parts of the country and the world. The island of Newfoundland, strategically located between Europe and mainland North America, also played an important role in advancing global telecommunications by providing a terminus for the world's first transatlantic telegraph cable. Aside from a few paths and trails, no actual roads linked Newfoundland and Labrador's communities until 1825, when the government built a carriage road between St. John's and Portugal Cove. Instead, the ocean served as the country's highway and marine vessels were its principal means of transportation. Most of the country's settlements were along the coast and surrounded by rugged terrain. Bogs, rocks, forests, and hills discouraged land-based travel and made attempts at road construction costly, difficult, and dangerous. The boat, however, provided an accessible means of transport for the country's largely seafaring population. As the number of new coastal communities increased throughout the 19th century, so too did their demand for regular delivery of food, mail, passengers, and other cargo from St. John's and elsewhere. Government-subsidized ferries ran regular routes to Trinity, Placentia, Bonavista, and Fortune Bays, while private operators provided marine services to Harbour Grace, Brigus, Conception Bay and elsewhere. During the second half of the 19th century, many operators replaced sail boats with new and efficient steam-powered vessels. 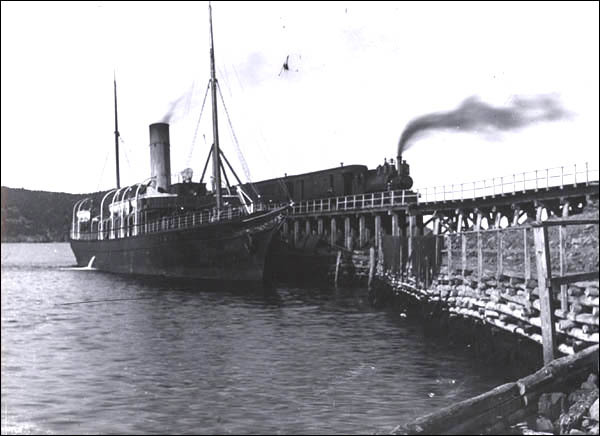 The government began to subsidize local firms that owned steamers – including Bowring Brothers and the Reid Newfoundland Company – to transport passengers and freight within the country, as well as to Nova Scotia and the United States. The SS Curlew transported mail and passengers along the Newfoundland and Labrador coast in the 2nd half of the 19th century. Photographer unknown. Reproduced by permission of Archives and Special Collections (Coll. 137 24.02.009), Queen Elizabeth II Library, Memorial University of Newfoundland, St. John's, NL. 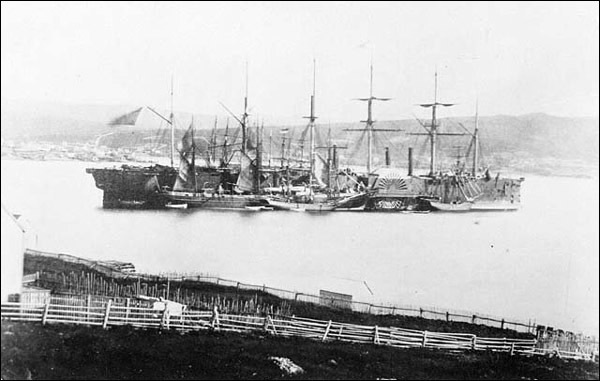 Government-subsidized steamers also brought mail, supplies, and passengers from St. John's to various Labrador communities during the second half of the 19th century. The service was of vital importance to Labrador residents, who did not have access to many of the goods and services available on the island. 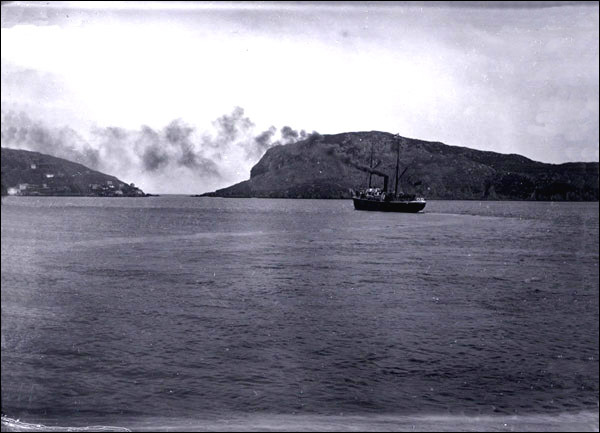 Vessels originally turned back after reaching Hopedale, but by 1883 extended their routes as far north as Nain. Many Labrador settlements continued to depend on coastal steamers for supplies, medical services, and news from the outside world well into the 20th century. Marine travel remained a principal means of moving people and goods throughout the 19th century, but advances were also made in land-based transportation. Although the first automobile did not appear in Newfoundland and Labrador until 1903 – the year railway contractor Robert Gillespie Reid bought a Rolls Royce – the country had already established a small network of roads during the 19th century. Governor Sir Thomas Cochrane felt road construction would help relieve poverty by creating jobs and make the country more accessible for agricultural and other forms of development. Under his administration, road construction became a major form of able-bodied poor relief; it also helped connect coastal communities with one another and made interior areas more accessible. The first roads appeared in the 1820s, when construction crews built a 14-kilometre road from St. John's to Portugal Cove and a 19-kilometre road from St. John's to Topsail. The Reid Company also built a series of roads connecting nearby communities with the railway during the 1890s. Far fewer roads existed in Labrador than on the island and most were rough trails that became inaccessible during the winter. Instead of carriages, dog sleds and snowshoes were the favoured modes of land-based transportation during the colder months, while the sea was the preferred mode of travel during the spring and summer. As government and industry became interested in exploiting mineral and forest resources in the island's interior, it became necessary to transport workers and equipment to these areas. Newfoundland and Labrador Governor Sir William Whiteway supported building a railway, which he believed would help modernize the country, diversify its economy, and link isolated communities. The Newfoundland railway connected major bays to one another and linked rural villages to larger centres. Photographer unknown. Reproduced by permission of Archives and Special Collections (Coll. 137 24.01.006), Queen Elizabeth II Library, Memorial University of Newfoundland, St. John's, NL. The government hired Robert Gillespie Reid to build and operate the railway in 1890. By the time workers completed the track eight years later, it ran northerly from the Avalon Peninsula, then westerly to the Exploits Valley, before turning south and ending at Port aux Basques. Alongside providing the first overland route across Newfoundland, the line connected major bays to one another and linked rural villages to larger centres. The first trans-island passenger train departed St. John's on the evening of 29 June 1898 and arrived at Port aux Basques 28 hours later. Advancements in telecommunications during the 19th century significantly altered the way Newfoundland and Labrador people interacted with one another and the rest of the world. Instead of waiting weeks or even months for mail and news to arrive by boat, residents in rural and urban communities could use the telegraph and later telephone to almost instantly contact people and businesses in other towns and countries. As North America's most easterly point, the island of Newfoundland played a central role in the development of transatlantic telecommunications, which earned it a degree of international fame and a place in telecommunications history. A telegraph is a machine that can send and receive messages by wire over long distances using Morse code. Telegraph lines existed in much of North America by 1850, but not in Newfoundland and Labrador. 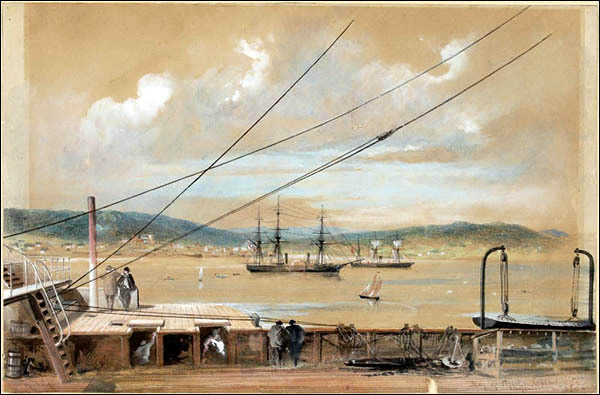 In September 1851, telegraph engineer Frederick Gisborne submitted a proposal to the Newfoundland and Labrador legislature to build a telegraph system from St. John's to Cape Race, on the southeastern tip of the Avalon Peninsula, and to Cape Ray on the island's west coast, and to connect that line to Nova Scotia by submarine cable. Although difficult to build, the system would attract more steamers to Newfoundland ports and significantly decrease the amount of time it took news to cross the Atlantic. Steamers could stop at Cape Race and wire news to media outlets instead of sailing an additional 36 hours to Nova Scotia or five days to New York. The legislature approved Gisborne's plan and in 1852 formed the Newfoundland Electric Telegraph Company to oversee the project. The company, however, went bankrupt the following year after laying less than 40 miles of line. Gisborne went to New York to raise funds and met wealthy American businessman Cyrus Field. Alongside agreeing to finance the St. John's to Cape Breton telegraph line, Field recognized that laying a submarine telegraph cable from Newfoundland to Europe would be of tremendous commercial and historic value. He formed the New York, Newfoundland, and London Telegraph Company (NYNLTC) in 1854 and by October 1856 completed an overland line from St. John's to Cape Ray and submarine lines to Cape Breton and New York. The New York Associated Press stationed a boat at Cape Race to intercept news from visiting steamers, which it then telegraphed to North American newspapers. Field, however, wanted to quicken transatlantic communications even further by building an underwater telegraph cable from Ireland to Newfoundland. He formed the Anglo-American Telegraph Company (AATC) in December 1856 to oversee the project, and after three failed attempts – due to bad weather and faulty cables – successfully completed the link on 27 July 1866 when the cable boat Great Eastern arrived at Heart's Content from Valencia, Ireland with the final stretch of telegraph cable. During its 13-day journey, the vessel traveled 1,686 nautical miles and laid about 120 miles of cables each day. Thousands of people flocked to the waterfront to greet the Great Eastern's arrival at Heart's Content and usher in a new era in global communications. The Great Eastern finished laying the world's first submarine transatlantic telegraph cable at Heart's Content, NL in July 1866. Photographer unknown. Courtesy of Library and Archives Canada (C-004484), Ottawa, Ontario. In the coming years, the telegraph became increasingly widespread in Newfoundland and Labrador. In addition to the existing system on the Avalon Peninsula, the government built a network of publicly-owned lines to smaller communities on the island, including Trinity, Bonavista, St. George's Bay, Fogo, Tilt Cove, and Twillingate. During the 1890s, Reid also built a telegraph line along the railway from Port aux Basques to Whitbourne, which connected with other government lines on the island. Radio joined the telegraph as an efficient mode of long-distance communication in the 20th century, after Guglielmo Marconi received the first transatlantic wireless (or radio) message on 12 December 1901 at Signal Hill in St. John's. Radio became a particularly important link to the outside world for Labrador residents, who previously had to wait weeks or even months for coastal steamers to deliver mail and newspapers. By 1905, the government opened radio telegraph stations at the Labrador communities of Venison Island, Battle Harbour, Domino, Seal Islands, and Smokey. Alexander Graham Bell introduced another form of fast and convenient long-distance communication in 1874 when he invented the telephone. The earliest known telephones in Newfoundland date back to 20 March 1878 and connected the St. John's homes of Postmaster General John Delaney and post office messenger John Higgins. Delaney built the private phone system from a diagram and accompanying instructions in Scientific American magazine. AATC established the first public telephone system in Newfoundland and Labrador in 1885 after leasing patent rights from Bell Company for its magneto telephone. This device consisted of three boxes mounted on top of each other – the uppermost box held a generator, which the user cranked by hand to ring an operator; the middle box contained a mouthpiece; and the bottom compartment held a battery and transmitter. Telephones did not become widespread in Newfoundland and Labrador households until the first half of the 20th century, when AATC sold its system to Western Union and various industrial companies established their own telephone exchanges, including the Anglo-Newfoundland Development Company at Grand Falls, Botwood, and Bishop's Falls, the American Smelting and Refining Company at Buchans and Millertown, the Dominion Steel and Coal Corporation on Bell Island, and Bowater's at Corner Brook. For other related articles view the Society and Culture Table of Contents Communications section.